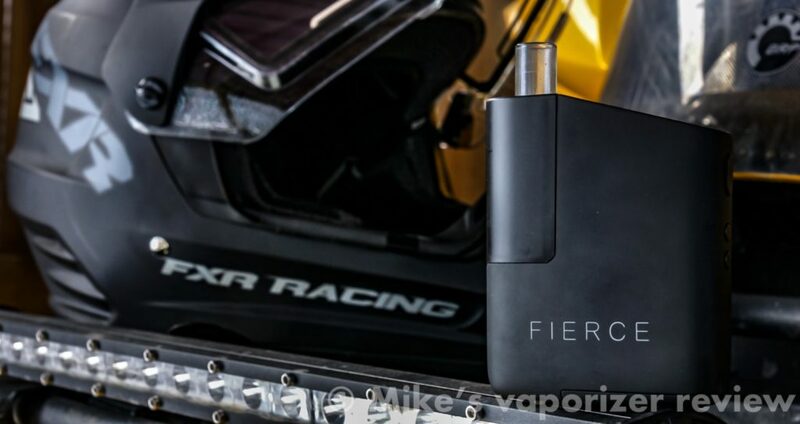 Loved the Fury 2 but found it just didn’t quite cut it….Well here’s it’s big brother The Fierce and he packs a lot of power under the hood for an unbelievable performance! 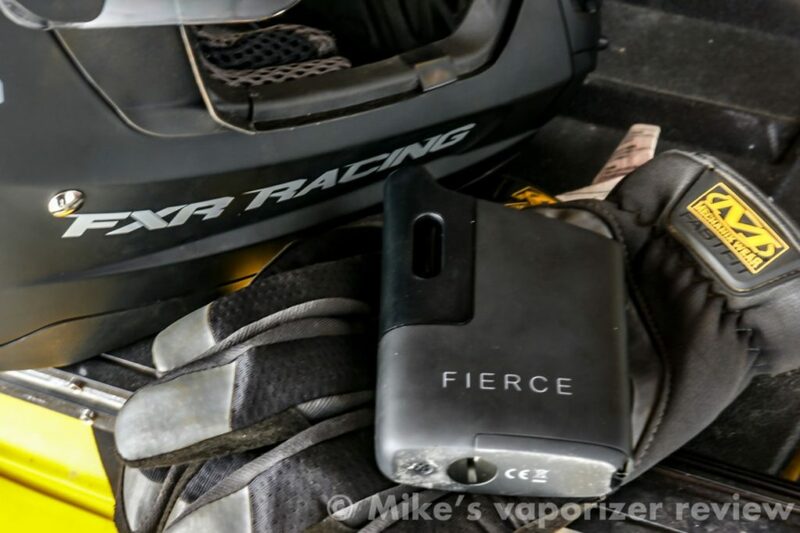 Well after the ever popular Fury 2 release people have been asking for a bigger better version. Healthy Rips listened to its customers and released The Fierce! 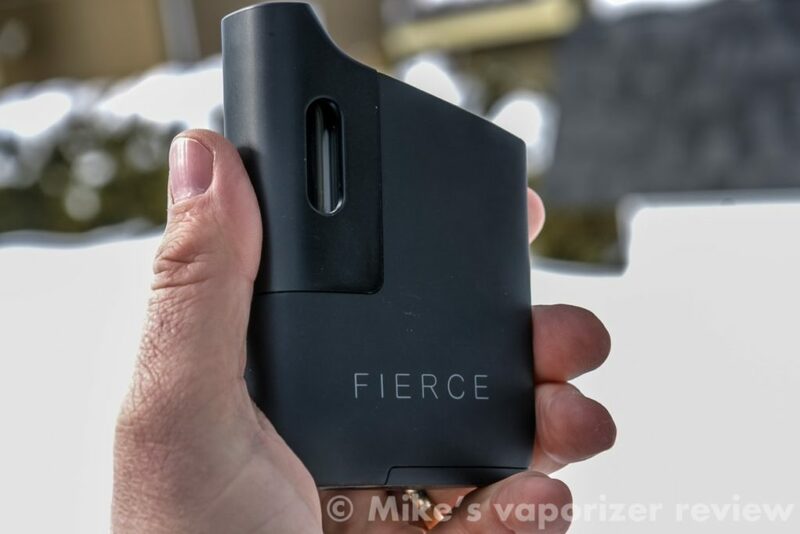 This vaporizer is in the same shape and finish of the Fury 2 but on a larger scale with a removable battery. The battery is not the standard 18650 but a proprietary 4050mAh lithium that provides around 2 hours of vaping sessions. Unlike the popular 18650 batteries you will need to order from HR as you will not be able to just grab one at any corner store. So when doing your order if your thinking extra battery remember to add it to your cart .The reason they are using the Lithium Polymer batteries instead of the 18650 batteries is because they have been known to explode so they decided safety was more important. The standard Fierce bundle includes all these accessories. As you can see by the list of accessories the standard bundle is a good complete kit to get you started with the Fierce. They even included a wall adapter, not sure why more companies do not include one. Another great feature is that Healthy Rips included with the Fierce one Glass Stem attachment! Thanks HR for adding this at no extra cost. After opening the box my first impression was wow this looks just like the Fury 2! So Healthy Rips kept the looks but have done some major improvements on the Fierce. Then when you actually hold the unit for the first time you think wow this thing is hefty and somewhat large.But after holding it a few minutes the ergonomy of the unit makes for a comfortable unit to hold even if its a larger unit than most. The finish is the same as the Fury 2 with its mat rubberish finish all over its aluminum body, making for a more durable and less slippery unit. I was worried the Fierce would have a cheap feel to it. But trust me this unit feels like quality the minute you hold it in your hands. 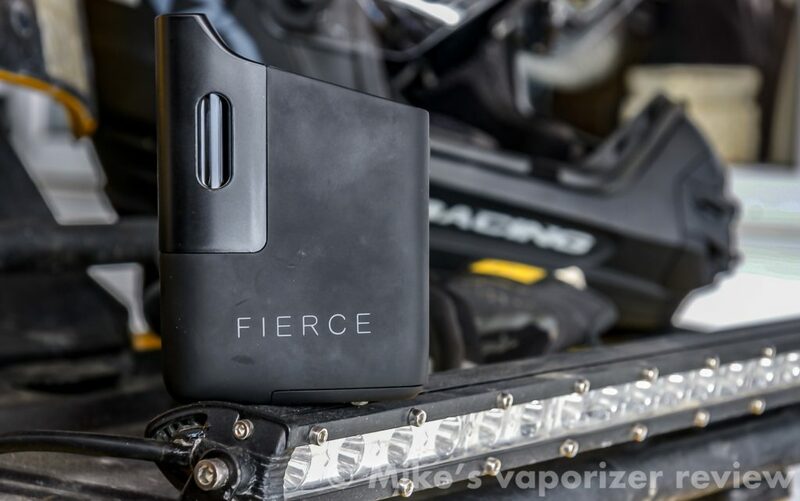 Priced at $189US for the standard bundle, the Fierce is in the same price category as many higher end vaporizers. But no worries the Fierce holds up to the competition as in some cases even outperforms some! The performance on the Fierce is great! This convection unit has great airflow producing really smooth vapour . The bowl is a fair size but when using the glass stems you do have to compensate on the capacity. As the stem holds the herbs and then inserted inside the oven, like its little brother, the oven capacity will be somewhat affected. Another great option is the large led display showing you the set temp, oven temp , session timer and the battery indicator. The Fierce will vibrate once the desired temp is reached, and this will only take like 30 seconds. Like all convection vapes the first draw or two will be weaker as you need to pull the heat through to get good vapour going. But once it gets going you will be enjoying some smooth tasty rips. 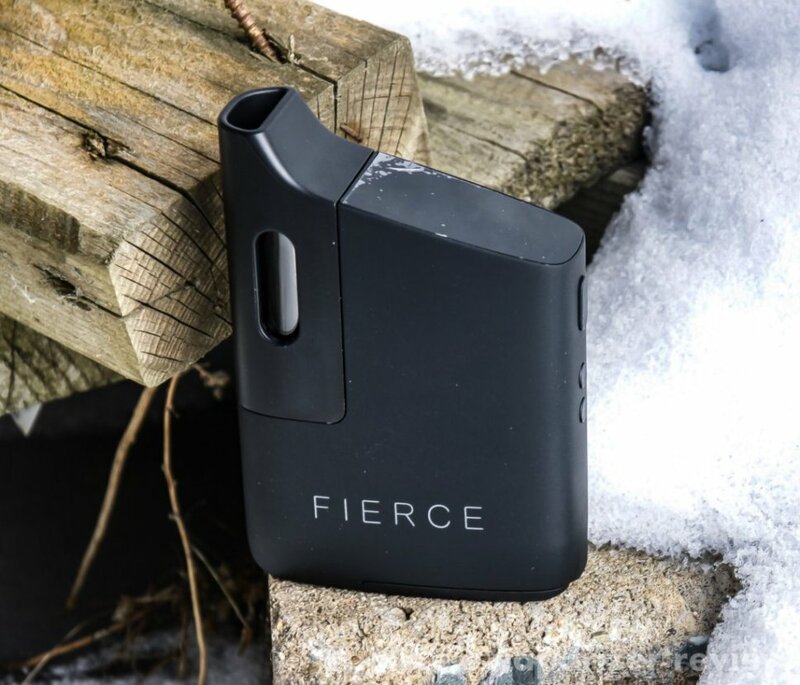 The adjustable sesh timer on the Fierce is from 3-8 minutes making it easy to personalize to your taste. 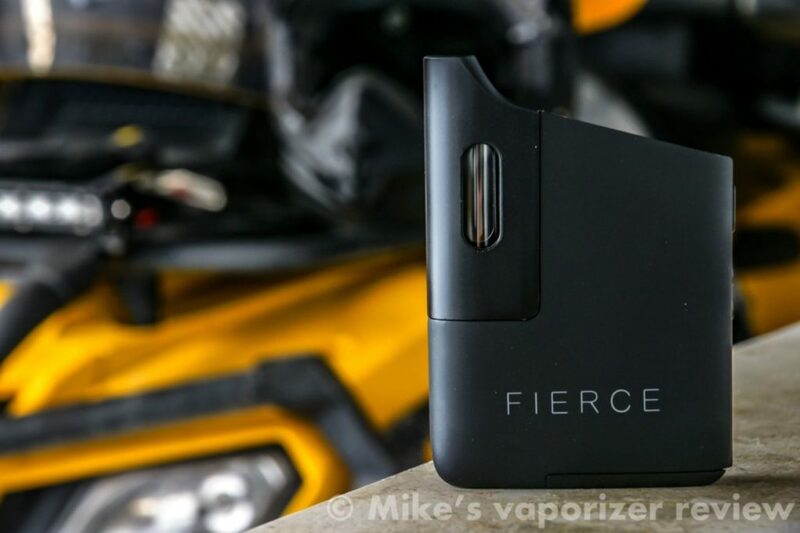 My only negative on the Fierce is the awkwardness of sliding on the mouthpiece accessory with the glass stem as well as loading the glass stem. It’s not a big deal but sometimes it does get off track and binds, and it also hits the grinder edge as you try to load the stem. 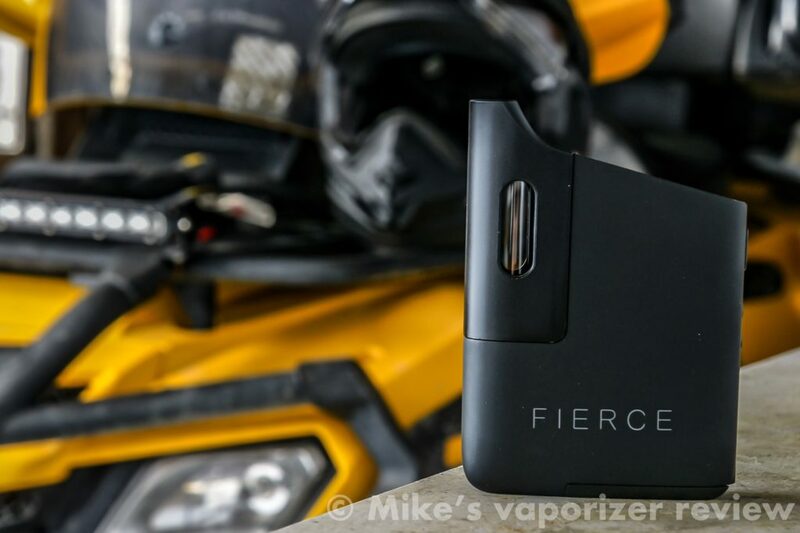 If you are in the market for a new vaporizer the Fierce is definitely one to look at. This convection unit delivers on flavour and the battery life is great! It might not be as portable to some due to its size and weight but to me it’s perfect. I have bigger hands then most so probably one reason why I love the size. But if you want power you will need to sacrifice on discreteness. The proprietary battery is a 4050mAh and depending on the temperature you vape getting 2 hours of use is possible. And with the removable battery , you can easily order an extra one to have for longer on the go use. The other feature worth mentioning is the USB-C charging, as most cell phones are upgrading to this, makes it more convenient having only one charger for all. The Fierce also has many optional accessories available. Here is a list of some of the most popular ones: dosing capsules, a glass bubbler, glass wpa, different length and shape glass stems ,extra battery ,they even have a Fierce charging dock. So if you like a good selection of options Healthy Rips has you covered.